AT&T Office@Hand Performance Reports is an additional tool that enables you to research call records to determine your business unit performance. 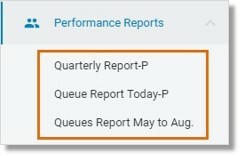 Performance Reports assists you in combining User, Queue, and Call Activity to evaluate performance using Key Performance Indicators (KPI) and targeted filters. Go to Admin Portal > Reports > Analytics Portal > Performance Reports. Click the Calendar to set the date. You can select preset time periods or select Custom Ranges. Click Done to set. Select the preferred Company Numbers report — Queues, Users, or Calls. Configure the settings for the selected report. Set the filters for Queues, Call Type, and Call Length, as needed. Click Select KPIs, then select the preferred KPIs from the list. Click Done. Download or Save your report. Reports can be downloaded in PDF or Excel formats. When saving a report, you can enter a new name or overwrite the report using the same name. Saved reports can be accessed from the left pane by clicking Performance Reports. You can also subscribe to reports. See Analytics Portal – Create Subscriptions – AT&T Office@Hand for more information.